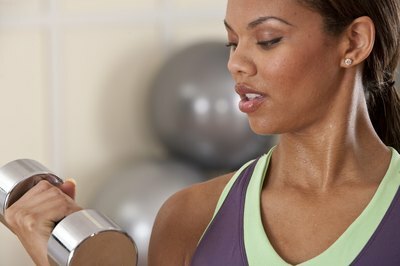 Dumbbell circuit training exhausts muscles while promoting fat loss. Incorporating weightlifting routines into your weekly exercise regimen is a crucial component in creating a healthy body and mind. If you’re searching for a way to add variety to your resistance training routine, dumbbell circuit training many be your ideal fit. Circuit training with dumbbells involves incorporating eight to 10 various exercises in rapid succession to provide a full-body workout. The premise of circuit training is to perform a high number of repetitions with minimal weight. According to Fabio Comana, M.A., M.S. of the American Council on Exercise, circuit training improves muscle definition or tone while simultaneously enhancing your cardiorespiratory endurance. Throughout a circuit training routine, you will exercise each primary muscle group with very little rest between stations. Beginners should strive to complete one cycle of eight to 10 stations. However, as you advance and become stronger, increase the number of cycles until your muscles are fully exhausted. The core of circuit training is the weight used and number of repetitions performed. The resistance level recommended by the University of New Mexico for best results is 40 to 60 percent of the load amount you can successfully lift one time before your muscles are fully fatigued. Perform a total of eight to 20 repetitions within a single workout station followed by a 15- to 45-second rest between each station. During the rest periods, select a dumbbell for the next exercise. Each exercise station is designed to isolate a particular muscle group. As long as the workout focuses on a specific muscle, the actual workout can vary. For example, when working the chest you may perform the standard dumbbell bench press or dumbbell flies. This aspect of circuit training allows users to add variety to their workout as workout movements may change as long as it isolates a particular muscle group. The American Council on Exercise suggests performing stations that isolate the chest, quadriceps, back muscles, abdominals, shoulders, hamstrings, triceps, biceps, calves and your lower back. Aerobic circuit training should also be incorporated; however, between each weightlifting station users engage in 30 seconds to three minutes of cardiovascular activity. The purpose of this circuit training variation is to enhance your cardiorespiratory endurance while simultaneously burning a high number of calories. In fact, the American Council on Exercise states a 150-pound person can burn up to 573 calories in 60 minutes by incorporating vigorously-intense cardio bursts into the circuit training routine. Aerobic activity such as jogging on a treadmill, cycling on a stationary bike or performing jumping jacks may be used in this form of circuit training.